The news from a large group of scientists warning of the dire effects of global warming and showing the impact of human activity on climate change didn’t create much of a stir here in Oklahoma. That’s because this is an epicenter of global warming denial, which includes among its adherents U.S. Sen. Jim Inhofe and the state’s largest newspaper, The Oklahoman. The main basis of the denial is simple, reckless subterfuge: The science behind climate change is actually a global, leftist conspiracy targeting the fossil-fuel industry for extinction. This is nonsense, and it puts us all at risk. A draft of a report created by the Intergovernmental Panel on Climate Change, as reported by The New York Times, shows that global warming would push sea levels three feet higher by the end of the century, a catastrophe of epic proportions for the world’s populated coastlines. The draft report also claimed that there’s a 95 percent certainty that carbon emissions produced by human activity are the main cause for the warming, The Times reported. Scientists have long argued that carbon emissions or greenhouse gases trap heat, which is then radiated back to the earth’s surface. The extra heat leads to the melting of the Arctic ice cap, which raises sea levels. It also causes weather extremes in the form of intensified severe events, such as hurricanes and flooding, that can be highly destructive and expensive. The extra heat also impacts wildlife and the world’s overall eco-systems. It creates new health issues for humans. The final report, created with the input of more than 800 scientists throughout the world, will be released after an IPCC session in late September, and it’s sure to garner the ire of Inhofe and The Oklahoman. They dismiss climate-change science as alarmist and detrimental to the oil and gas industry. 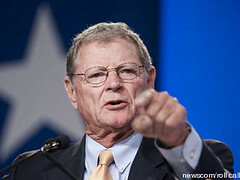 The IPCC won the 2007 Nobel Peace Prize, along with former Vice President Al Gore, but its critics, such as Inhofe, are relentlessly dismissive of its findings. I also find it quite interesting that to end this week of coincidental events on climate change alarmism, certain liberal media is showing a climate change special with reportedly no interviews from those challenging the theory. There seems to be a coincidental coordination between the White House, the President’s campaign, and the liberal media that is weaving a false and potentially harmful narrative of alarmism. This agenda will leave our nation less secure, less prosperous and less informed. The anti-environmental efforts of Inhofe and The Oklahoman are only a blip in the waning decades of The Oil Age. Inhofe’s large campaign contributions from the oil and gas and utility industries show the main reason behind his political motivation. The Oklahoman is now owned by a Colorado billionaire oilman. But how much damage and destruction will humanity have to endure before it wakes up?